Is This GoPro Stock Price Rally a Buying Opportunity? Subject: Is This GoPro Stock Price Rally a Buying Opportunity? The GoPro stock price surged 19% yesterday (Wednesday), and now readers are asking us if this GoPro stock rally is a buying opportunity. GoPro Inc. (Nasdaq: GPRO) announced Wednesday it hired Daniel Coster away from Apple Inc. (Nasdaq: AAPL) as vice president of design. Coster will join GoPro this month and will report directly to GoPro CEO Nick Woodman. He will head the company's hardware design team. Coster was a core member of Apple's secretive industrial design team for more than two decades. He is credited with contributing to devices such as the iPhone 4 and iPad wireless keyboard. Since joining Apple in 1993, Coster amassed over 500 design patents. He also worked closely with Apple's renowned chief design officer, Jonathan Ive. "Mr. Coster will influence all aspects of design at GoPro in his new role, including hardware and software and services, lending his strategic vision and expertise to maximizing the GoPro user's experience from end to end," GoPro said in a statement. Landing Coster from Apple is a huge win for the company, but the GoPro stock price still faces plenty of headwinds in 2016. Plus, a large part of the recent rally in the GPRO stock price is attributed to short covering. Short interest is 32% of the GoPro stock's float. Should I Buy into the GoPro Stock Price Rally? GoPro has been struggling for the last several months amid concerns over the viability of its business. Competition is growing and profits are slipping. Last quarter, GoPro posted a loss of $0.08 per share. That was well below the $0.03 per share analysts had projected. Revenue sank 32% year over year. The company cited lower sales totals for its cameras as the main reason for poor earnings. Then in January the company slashed its headcount by 7%. GoPro is expected to report Q1 2016 results after the close on April 25. Forecasts are for a loss of $0.59 per share. If those poor estimates weren't enough, its latest 10-K filing was downright bleak. The company said it anticipates R&D expenses will continue to increase in 2016. Unanticipated problems in developing products could also divert substantial resources. That could impair its ability to develop new products and enhance existing products. Of course, it will also boost costs. "In future periods, we could again experience a decline in revenue, or revenue could grow more slowly than we expect, which could have a material negative effect on our future operating results," the 10-K said. "Specifically, we anticipate our first quarter and full year 2016 revenue to decline on a year-over-year basis. Lower levels of revenue and higher levels of operating expense investment may result in limited profitability or losses." We've been bearish on the GoPro stock price since it peaked in October 2014. GoPro was one of the most highly anticipated and successful initial public offerings of 2014. Priced at $24 a share, the GoPro stock price surged 31% when it debuted on June 25, 2014. By July 2014, the GoPro stock price was up 100% from its IPO price. At its all-time October 2014 high, Money Morning Chief Investment Strategist Keith Fitz-Gerald told investors to ignore the hype. By August 2015, the GoPro stock price had slipped to $60. 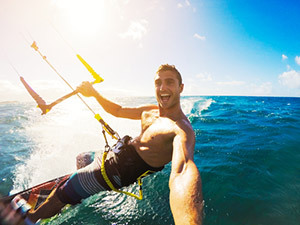 "GoPro makes some really cool products, and they've got a rabid fan base of people who film themselves and others doing some truly outrageous things," Fitz-Gerald said in early 2016. "But that doesn't mean they've got sustained profit potential. The company has engaged in deep, deep discounting this holiday season, and that's going to eat into margins." "I'm always willing to pay up for a company that's 'best in class' or that has a defensible technology. GoPro has neither," he continued. "I won't hesitate to line up for a stock that's got control over its margins and, by implication, the pricing power to go with it. GoPro doesn't." The GoPro stock price today gave back a big chunk of yesterday's gain, slumping 5% to $13.12. Year to date, the GoPro stock price is down 26.37%. Over the last 12 months, shares are down 70.26%.